Wisdom teeth are the last molars that erupt in the late teen years and hence are called 'Wisdom' teeth. Problems arise as there is not enough room in the upper and lower jaw for them to erupt and grow properly. So they become 'impacted' or stuck in the bone or gums. These have to be surgically removed if they cause pain, infection or decay of the neighbouring teeth. Surgical removal of wisdom teeth is the most simple and commonly carried out surgical procedure by a Maxillofacial surgeon. What are wisdom tooth and where are they present? Why Should I get my wisdom teeth taken out? Sometimes only a small portion of the tooth erupts through the gum, making cleaning difficult. Bacteria can get under the gum and cause infection and inflammation. When wisdom teeth are in mal-position or come in crooked, they can cause bone loss, tooth decay or loss of teeth in front of them. Upper wisdom teeth that point outwards, can make the patient to frequently bite into the cheek resulting in ulceration of the cheek tissue. The myth is that this surgery is very painful. For many people it is their first exposure to surgery and hence being nervous is quiet natural. Wisdom tooth surgery is usually done under local anaesthesia. The gum is turned back (reflected), and the wisdom tooth is uncovered by removing a small portion of the bone which surrounds the tooth. Many a times the tooth is split for easier removal. One or two stiches are placed at the end will usually dissolve. 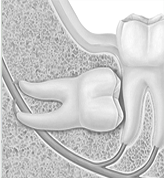 Should everyone’s wisdom tooth be removed? Not everyone's wisdom teeth must be removed. If the molars are fully erupted and functional, then they are let to remain, but simple monitoring satisfies most patients. If your wisdom teeth are causing pain, swelling, infection or decay of your neighbouring teeth then we recommend removal of these symptomatic teeth. The surgery is commonly carried out between the ages of 18 to 25 years, although the procedure can be performed at any age if necessary and is safe. This is because younger adult's bone healing capacity is maximum. Our goal at Mukha clinic is to make your experience of surgery safe, efficient and as easy as possible. Our belief is in compassionate care in our state of the art surgical facility. We are geared towards working with anxious patients and family members and always put our patients concerns first. Wisdom teeth are the third or the last molars that erupt in the mouth. Dr Girish Rao, Professor & Consultant Oral & Maxillofacial Surgeon at Mukha explains about what are wisdom teeth and all about Wisdom tooth surgery.